AUBURN, Ala. (AP) — With defensive stops hard to come by, Canyon Barry and the Florida Gators simply scored more than they had all season. Barry scored a season-high 30 points and the 15th-ranked Gators kept up with high-scoring Auburn for a half, then sprinted away to a 114-95 victory Tuesday night. Known more for their stingy defense, the Gators (21-5, 11-2 Southeastern Conference) blew past their previous scoring high of 106 points en route to a seventh straight win. They dominated after going into halftime locked in a 50-50 tie, coming out of the locker room on a 13-3 run and never looking back despite losing center John Egbunu to a knee injury early. 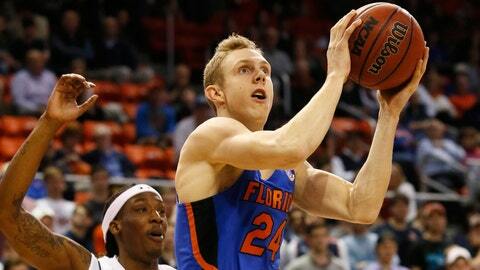 “It was an odd game to me,” Florida coach Mike White said. “Outside of early second half we never could find a defensive rhythm. They were fantastic offensively. They’re just very difficult to defend. Good thing for us it was one of those nights where we made a bunch of shots. We made a bunch of shots, we made a bunch of free throws. Florida shot 56 percent from the field and made 11 of 19 3-point attempts and 37 of 42 free throws. Auburn (16-10, 5-8) became the first team to reach its season average in regulation against the Gators, but couldn’t slow them down on the other end. The game was so dominated by offense that 13 players scored in double figures. It was also easily the most points allowed by a Florida team that came in giving up 65.2 points per game. Anfernee McLemore led Auburn with a career-high 19 points, T.J. Dunans had 13 and Ronnie Johnson 12. KeVaughn Allen scored all 17 of his points in the second half for Florida, which had seven players reach 10 points. Devin Robinson added 14. Kasey Hill had 11 points and 12 assists. Egbunu had 10 points before leaving with a left knee injury midway through the first half. He didn’t return, and White said he didn’t know the nature of the injury. Egbunu is scheduled to have an MRI on Wednesday. “He was having a heck of a game, too, before he got hurt,” White said. Barry — who had his made free throw streak end at 42 — made 3 of 5 3-pointers and 11 of 12 foul shots. It’s the first time in nearly two years Auburn has allowed 100 points, the last time against Kentucky on Feb. 21, 2015. Florida has matched the longest win streak in White’s two seasons. The Gators have won 10 straight meetings, including nine in a row at Auburn. Auburn hosted Florida for the first time since 2014, with the three meetings since coming in Gainesville. The Tigers allowed 60-plus second-half points for the third straight game. The Tigers started 5 of 6 from 3-point range and made 1 of 15 from there. Barry’s school-record streak of made free throws ended at 42. Barry, who shoots underhanded like his Hall of Fame father Rick, missed the second of two attempts with 15:20 left in the first half. He still had 13 points in the first 8 minutes. Florida visits Mississippi State on Saturday to continue a stretch with three of four games on the road. Auburn travels to Texas A&M on Saturday then goes to LSU three days later.